The text in bold italic that begins each program description is quoted from the original program guide entry. As some tapes lack complete descriptions, and we do not yet have all the program guides in which to find a description, some of the notes below are vague. If you can enlighten us about any program, please email us about that too. Discover your paranoid quotient (p.q.) with Tom Allen as he checks out the survivalists. Are you ready for the end? Or is it the beginning? Until the 1970s seed companies attracted little attention. After patent laws protected hybrids the rush was on. Credits: Tom Allen and all those who built today's seed savers network. This was originally broadcast 3/16/1980 on KRAB FM, Seattle; rebroadcast 2004 on RFPI Costa Rica. Produced before the development of GMOs, this program is a time capsule that provides historical context to GMO issues of today. Historical audio clips from 1974 Alternative Agriculture Conference held at Central Washington State College, Ellensburg WA. Since the beginning of agriculture, farmers have saved seeds locally and selected the best plants for future crops. This resulted in enormous genetic diversity and resilliance that was at risk in 1974 as local seed companies were gobbled up by conglomerates and is at greater risk today. Thankfully, the seed savers movement has created islands of heirloom varieties. The movement began in the early 1970s and continues today but must be supported and protected. In Europe farmers and gardeners can only purchase seeds from an approved list and are prohibited from growing crops that are similar enough to patented varieties to cause confusion. Could it happen in the US? OUT OF BOUNDS - "The Sonics: Comeback or Comedown?" Interview with Art Thiel, P-I sportswriter who covers basketball. Sports received short shrift at KRAB. Gene Johnston organized a softball team one summer. I think it was Phil Andrus that organized volleyball in a vacant lot another summer. In the mid 1970's Professors Roger Sale and Malcolm Griffith, replaced later by Norm Arkans did a program covering basketball, "On the Foul Line". And, somewhere there is an episode of Greg Palmer's "Government Inspected" devoted to professional sports. And here, along comes Doug Honig with a thoughtful interview of the up and coming sports writer for the Seattle PI, Art Thiel. Thiel, though still in Seattle, has covered a lot of territory in the last 36 years. To borrow from the introduction on his sports news service site, SportspressnewsNW.com, "Never having met a metaphor he could not twist beyond recognition, Art has been illuminating, agitating, amusing and annoying Puget Sound sports readers for a long time." First Avenue, Seattle documents the passing of more than a street of army/navy surplus and novelty stores, taverns, seedy restaurants, and storefronts advertising to "adult" interests. It is filled with the voices of the people that lived there - those whom Emmett Watson, John Hinterberger, and Susan Paynter seemed to think gave Seattle "character". Paynter, interviewing Tiny Freeman in 2007, asked "Where have the big-livers, characters and genuine articles gone?" To which Tiny replied "It's not just Seattle, sweetie. It's the whole shiterie." There are problems of city life today that can be attributed to the decisions of the last century. Some of those decisions seem to have been directly related to looking the other way when "trying to do the right thing", like saving an historical landmark and center of Seattle "community". The preservation of the Market resulted in the displacement of poor and vulnerable people, and when there were limited resources to provide them with alternative housing, it was just too bad. Is this program still relevant today? The 96 room *Gatewood Hotel (built in 1898) is featured in the fifth episode of this series. It was closed in 1982 long enough to drive out the previous tenants and sell off the furniture, but reopened shortly after and continued to operate as a low cost flophouse/hostel until 1985. It then became a rallying place for advocates of housing for the homeless. Then, in 1991, Mayor Norm Rice leased it for 25 years and took on renovating it for subsidized low income housing. The lease was up last year and on Jun 30, 2017 it was announced that the 4-story Gatewood property is to become a 14-story tower of mixed use: commercial on first floor, 145 luxury hotel rooms above, and 12 luxury housing units on top. 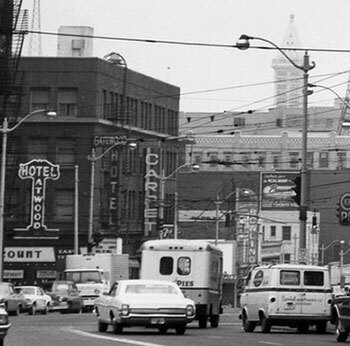 “First Avenue, Seattle” was a five-part oral history that chronicled the community of Skid Road hotels that catered to working stiffs and transients, cheap cafes and clubs, union halls, longshoremen bars and a working downtown waterfront from the 1920s to the 1980s. The neighborhood vanished with the redevelopment of downtown Seattle, the Pike Place Market and Belltown. The radio series was written and produced by Jim Simon and Roz Barnett, with production assistance from Joe Justad. A companion photo exhibit by Nancy Walz was displayed at the Museum of History and Industry. This oral history project was also featured in the Sunday Pacific Magazine of The Seattle Times. The project was sponsored by the Pike Place Market Development Authority, with funding provided by a grant from National Endowment for the Arts. Narration and announcing is by Jim Stutzman, former KZAM news director. Tonight we begin the first part of this five-part series produced for radio by Jim Simon and Roz Barnett. Part 1 of this examination of Seattle's First Avenue and waterfront communities. *The history of the Gatewood Hotel ought to be of interest to anyone curious about the relationship between community improvement projects (such as the Market preservation) and commercial/corporate business interests and developers. A quick search through the Seattle Times revealed an interesting trail of stories relating to the acquisition by a corporation of the Gatewood property (and a number of other downtown Market area parcels) in 1966, and how their interests did, or did not, mesh with Market preservation plans. In 1975 Sam Israel acquired the building and the land in an indirect sale from the Central Park Plaza Corporation through the People’s National Bank of Washington, trustee. The hotel furnishings were sold at public auction on May 24, 1981. The hotel land and building together were converted to part of the Samis Foundation holdings in 2001. The fight in the 1980's to preserve, and then to secure, low income and affordable housing is well documented in the Seattle Times, but perhaps it is worth restating that this has been going on since well before the millenium. A half-hour documentary tracing the development of the Polish Solidarity Movement. Produced by Doug Honig. This is a two part program - The documentary was followed by a live panel discussion with members of Solidarity responding to phoned in questions from listeners, while Doug moderates. With an in studio interpreter. Can Socialists Find Happiness in Santa Cruz? Doug Honig interviews Mike Rotkin, Socialist elected mayor of Santa Cruz, CA. The liberal leanings of the Pacific NW, at least of its coastal territory, have been touted for decades. The authenticity of those claims have not been particularly obvious to some of us, but after 136 years Seattle did get its second Socialist City Council member - Obviously not serving concurrently. Anyway, it was surely a novelty when Mike Rotkin, the new (1981) Mayor of Santa Cruz, came to Seattle. In the ensuing years Rotkin served six terms on the Santa Cruz city council, and 5 terms as its mayor. More about Mike Rotkin can be found in the Santa Cruz Sentinel and the City on a Hill Press. Doug Honig first appeared on KRAB in a 1971 panel recorded at a Tenants Rights Workshop at the University District Center. In 1980 he volunteered at KRAB, and started producing programs ranging from sports commentary to interviews with politicians and activisits to documentaries about the Polish labor movement and the social economics of cooperatives. On Jan 28, 1982, at the age of 82, Admiral Hyman G Rickover testified to the Joint Economic Committee of Congress. Although he is credited as being the driving force behind the Navy's adoption of nuclear powered warships, in this hearing he describes a military supported by special interests, and a likelihood of nuclear war unless disarmament is given priority. Three days after giving testimony he was relieved of command and retired from the armed services. The questioning comes from Senator William Proxmire and Representative Frederick Richmond. This program appears to have originated at Pacifica, appearing in the PRA database with a length of 57 minutes. Our copy, preserved and shared by Bob West, is only 42 minutes, so it may be incomplete. According to the Feb 1978 program guide "Kay Hutchins, who, despite vague rumors to the contrary, is not a stuffy old Englishwoman..." Between 1978 and 1984 she read from a variety of books and other publications and also recorded conversations with numerous guests at KRAB. Emmett Watson wrote for the Seattle Post-Intelligencer from 1956 to 1982, and then moved to the Seattle Times, where he continued to write until 2001. He seemed to frequently be inspired, or bemused, by the antics of KRAB, Lorenzo Milam, and others associated with KRAB, including Richard A C Greene and Tiny Freeman. Irritated with the champions of "progress" in the Chamber of Commerce's "Greater Seattle", Watson wrote about his own fictional anti-progress organization "Lesser Seattle". Meanwhile, Jon Gallant of KRAB and Jack Straw was writing of "Grosser Seattle". We don't know which was first. Anyway, this was recorded but never broadcast. See the tape label at right. We hope to eventually have more of Kay Hutchins' programs. Perhaps best known for "Freight Train" she was "discovered" by Peggy Seeger. This recording appears to have been made in May of 1982. Not that many decades ago, most caskets were the products of neighborhood cabinetmakers, or of the friends and family of the deceased. In one rural Washington community, this tradition has been restored - when someone dies, their neighbors make the casket. They do this not as a business enterprise, but, as one of the builders says, as "the last thing you can do for your friends." Produced by Phil Andrus. Phil tells us that the subject interviewees of this program asked that their location identity not be revealed. They weren't interested in turning casket making into a business. So we don't know if, after thirty one years, their casket making tradition has persisted.